Drought conditions are favorable for two-spotted spider mite outbreaks. Dry weather, low humidity and temperatures exceeding 85°F are associated with spider mite population growth. Spider mites damage plants by piercing cells and sucking sap. Mites often go undetected until damage is severe because of their tiny size and because spider mite feeding and drought stress symptoms are similar. It is important to be aware of twospotted spider mite under these conditions, recognize plant damage symptoms, and be able to identify live mite colonies in the field. Initially, leaves are discolored with tiny white to yellow specks referred to as ‘leaf stippling’. These symptoms often start on the lower leaves in the canopy so you may not see the early signs without a closer look. As damage progresses throughout the canopy plant leaves turn yellow to bronze and leaf drop can occur under heavy infestations. Damage often begins along field edges where mites have migrated from adjacent fields, grasses and weeds, or in drier areas within a field. You may notice a semi-circle of yellowing plants along field edges or spots within the field. Generations are completed in 4 to 14 days with faster developmental rates above 90°F. Spider mites have a high reproductive potential, with 7-10 generations if hot, dry weather conditions persist. Soybean – Scout field edges and dry areas of the field where infestations are likely to start. 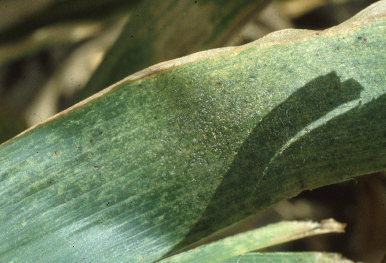 Green plants within the field may also have mites or early signs of leaf stippling. Check the upper, middle and lower canopy for leaf stippling, webbing, and presence of live mite colonies. Examine the undersides of leaves with a hand lens. You can tap the plant canopy over a white sheet of paper. Use a hand lens to look for moving tiny ‘specks’; they may be twospotted spider mites. 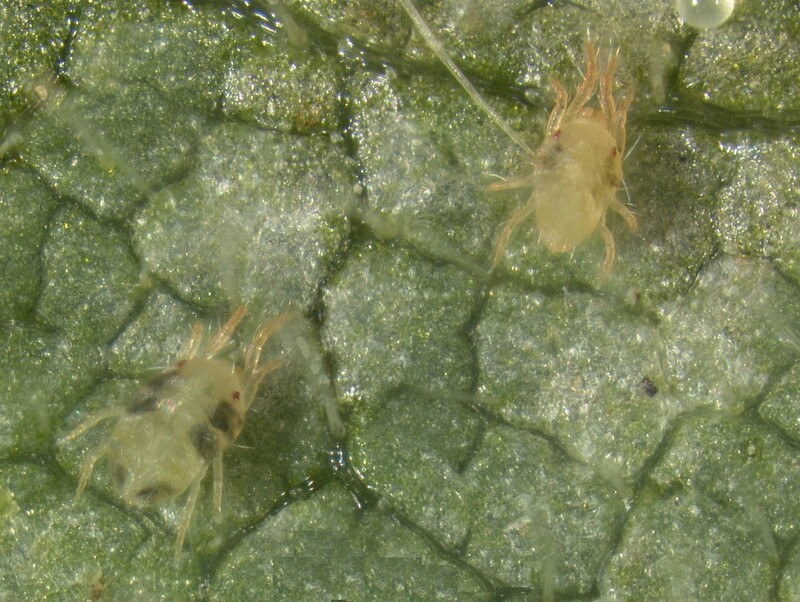 No numeric economic thresholds have been developed for twospotted spider mite. Consider treatment when field margins are discolored and mite colonies have been confirmed. Check the interior of the field as green plants may also be in the early stages of infestation. Remember to look for mites and stippling on lower leaves too. The two most common insecticide active ingredients used to control mite populations are products with the active ingredients chlorpyrifos or dimethoate. Leaf bronzing symptoms in soybean from twospotted spider mite. Photo: Mike Ballweg, UW-Extension Sheboygan Co. (2005). Treatment decisions can be difficult as drought conditions co-occur with economic spider mite infestations and repeat applications may be required. 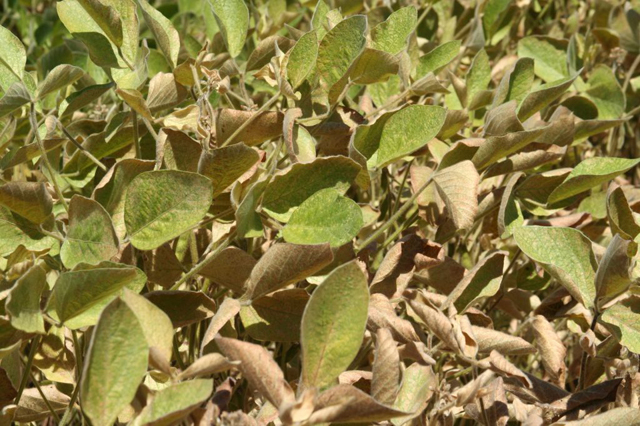 The best approach is to be aware of twospotted spider mite potential and scout soybean fields before damage advances to leaf yellowing and bronzing. Data vary from state to state during drought years with spider mites, but yield reductions of 40% to 60% have been documented. Corn – Twospotted spider mites do not usually cause economic damage in field corn. When this pest occurs in dry years, yield losses are more consistent in soybean. However, corn should also be scouted for twospotted spider mite during extended dry periods. Begin by checking for presence of spider mites on individual green leaves on corn plants along field edges. Repeat the procedure on at least 10 plants at several locations in the field. Moderate infestations will result in leaf stippling with chlorotic spotting (pale yellow) on the leaf surface. Look for spider mite adults, nymphs and/or eggs, as well as webbing on the underside of leaves. Leaf stippling and chlorosis on corn from twospotted spider mite. Photo: University of Wisconsin Extension (2005). Researchers in Texas (Extension entomologist Patrick Porter and colleagues) have developed economic injury levels for spider mites in field corn. The text that follows is from University of Nebraska publication G1167, Spider Mite Management in Corn and Soybeans, and Texas A&M Extension Publication E-400, Managing Insect and Mite Pests of Texas Corn. It explains how to scout and calculate an economic injury level for twospotted spider mite in field corn, and how to adjust the threshold calculation for current market values of corn. To use this procedure, the per acre control costs (miticide + application costs) and the expected value of the crop (yield [bu/acre] x corn grain value [$/bu]) must be estimated. A two-step sampling procedure is used. First, check the field for the presence or absence of spider mites on individual green leaves on a corn plant. Record the number of infested green leaves (containing one or more live spider mites) and the total number of green leaves on each plant. Repeat this procedure on at least 10 plants from different portions of the field. Compare the percentage of infested green leaves to the numerator in Table 1 associated with the appropriate control costs and crop value. If your sample equals or exceeds the value in the table, then estimate the percentage of leaf area on the corn plants that is damaged by spider mites, and compare that value with the denominator in the table. At either step, if the sample value is less than the value in the table, control of spider mites is unlikely to be profitable. For example, if your estimated control costs are $15 per acre and the crop value is $300/acre (150 bu/acre x $2.00/bu), if 29 percent or more of the green leaves are infested, then you need to estimate the percentage of leaf area on the corn plant that is damaged by mites. If 16 percent or more of the total leaf area is damaged by mite feeding, it will likely pay to control spider mites in this example. 1. For percent infested leaves the formula is (cost of control x 600) ÷ (price per bushel x bushel yield). 2. For percent of leaf area damaged the formula is (cost of control x 312) ÷ (price per bushel x bushel yield). A more general, simple guideline from Colorado State University is to treat if damage is visible in the lower third of the plant, and mite colonies are present in the middle third. This information from the southern (Texas) and western (Colorado) corn belt, where dry conditions and spider mites more routinely co-occur, is useful for current Wisconsin conditions. Once corn has reached the hard-dough stage, no economic benefit will result from treatment. 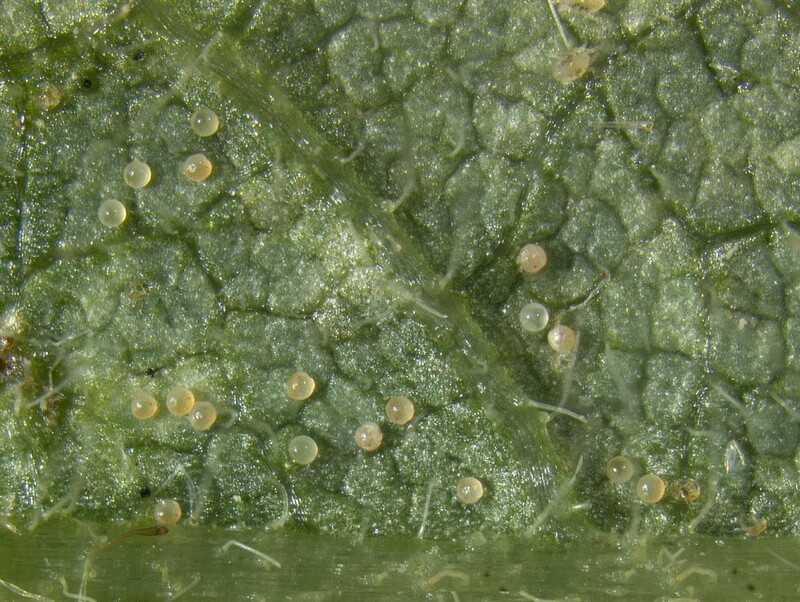 The most effective natural control of twospotted spider mite in soybean and corn is the fungal pathogen, Neozygites floridana. It attacks all mite stages, and is specific to spider mites. Infected mites have a waxy or cloudy appearance. This mite-killing fungus requires temperatures cooler than 85°F, with 90% relative humidity, to produce infective spores. Periods of at least 12-24 hours of relatively cool, moist, and humid conditions are necessary for the fungal pathogen disperse and infect a spider mite population in a field. Mites die within 1-3 days of infection, and mite populations can decline quickly once the pathogen has spread. Although rainfall reduces risk of damaging spider mite populations, thunderstorms alone will not eliminate infestations, particularly when rain arrives after large mite populations are established and when rain is followed by dry, hot conditions. For more information, please see UW Extension Publication 3890 – Twospotted spider mite management in soybean and corn. Wright, R., R. Seymour, L. Higley, and J. Campbell. 2006. Spider mite management in corn and soybeans. University of Nebraska, Lincoln. Extension Publication G1167.